As Cowley & Company’s founding partner, Lee came to the practice of law late in life, having worked as a chiropractor and acupuncturist for fifteen years before deciding to go back to school. He first graduated from university in 1978 concurrently from the University of Toronto (Bachelor of Science; Major in Chemistry) and the Canadian Memorial Chiropractic College (Doctor of Chiropractic). On graduation, he worked as a small town chiropractor from 1978 to 1993, most of those years in the small rural community of Wingham, Ontario, incidentally the birth place of Alice Munro, the reigning winner of the Nobel prize in literature. In 1984, Lee enrolled in part time studies at the Faculty of Mathematics at the University of Waterloo as a hobby. 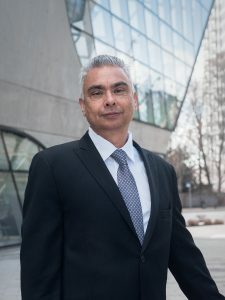 He graduated in 1990 with a Bachelor of Mathematics degree with an award for the highest grade point average for all part time Mathematics students. In 1993, Lee crossed the country in his little bright red 1990 Mazda Miata, which he still owns. He earned his law degree from the University of Victoria in 1996, graduating with the J.P. Lawson Academic Award. Lee started his working life in law with the Provincial Crown as a criminal prosecutor, his favorite job of all time. Unfortunately, the pay was at the rock bottom end of the scale. After an extended stay with a civil law firm, Lee founded Cowley & Company in the fall of 2000. Lee presently works with the firm as a consultant. Lee has seen his little law firm grow from two persons in 2000 to forty persons, less than fourteen years later. Lee lives in the Queens Park area of New Westminster in a big, old, drafty but wonderful house with his wife Jennifer, son Trenton and daughter Theresa. Trenton is a first year student in the Architecture program at BCIT and is still in the family home. Theresa has flown the coop, studying drama/acting at the University of Toronto. She is back home every school break. One thing that you may not have guessed about Lee, given his present slow and steady manner of driving, is that, in 1978, he won a car rally in Toronto that had over 300 entries.